AM: This special City Tour will take you back and show you 500 years of history of Lima. You will discover the history and traditions hidden in every corner of the capital of Peru. Visit to the market of Surquillo where we will see and try some exotic fruits and vegetables grown in the country. Continue to Lima downtown. We will stop at El Cordano bar, a Lima institution since 1905. This old-world dining hall with its swinging, “saloon-style” doors has received practically every Peruvian president for the last 100 years as a customer. From here we will visit some historical buildings on a pleasant walking tour. We will visit The Archbishop's Palace of Lima, the residence of the Archbishop and the administrative headquarters of the Roman Catholic Archdiocese of Lima. The current building is considered a prime example of neo-colonial architectural that developed in Lima. Continue with our walking visit, we will pass through The Jiron de la Union, a pedestrian street that for many years was one of the most important boulevards of the city. We will finish our Lima´s Down Town visit with a delicious Piscosour at El Bolivar Hotel, that was declared Historical monument on 1972. Finally we will visit the modern part of Lima, passing through Huaca Huallamarca ending in Miraflores with a pleasant 10 minutes walk in the Malecon with a nice ocean view. PM: Visit Barranco Bohemian district. Barranco is a pleasant suburb of Lima that has kept its character much better than most of the city, and is the bohemian heart of the city. Continue with the visit of Pedro de Osma Museum. 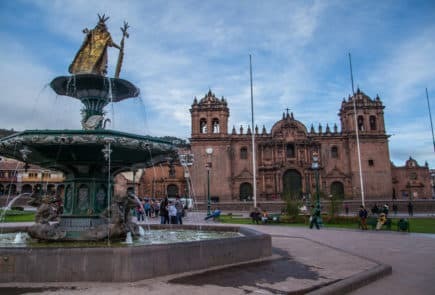 The privately-run Museo de Arte Virreynal Pedro de Osma has an exquisite collection of colonial art and furniture, as well as metalwork and sculpture from all over Peru. Finally, visit Las Pallas, a stunning arts and crafts shop in the heart of Barranco, the city’s art-drenched, bohemian district. Bursting with color and striking designs, the variety of crafts sold in the gift shop at Las Pallas can be anything from weavings, ceramics and paintings to masks, baskets, charms and amulets. We encourage those of our guests who have an interest in traditional Peruvian folk art and artisanal crafts to stop by at Las Pallas during a luxury trip to Peru. PM: Walking city tour, including a visit to the district of San Blas, with its winding streets, the whitewashed houses, the blue balconies hung with geranium-filled flowerpots, the uneven line of the tiled rooftops and the endless stairways. In the neighborhood live the folk artists of Cusco, who for centuries have used their hands to tell the tale of their longings and frustrations working in stone and woodcarving, sculpture, doll-making, silverware, weaving and textile arts, gold-leaf, mask-making, and an array of ceramics in utilitarian, architectural, sculptural, monumental, grotesque and many other styles. At 8:30AM the guide will pick you up from your hotel (Cusco) and drive through the mountains towards the Sacred Valley of the Incas until we reach our private river put-in located in Pachar. Here you will receive your rafting equipment and a safety briefing. (Toilet facilities are available). While we admire the spectacular views of the mountains and archaeological remains, continuing towards Ollantaytambo and its amazing Inca terraces, at the time we experience class 2-3 rapids, to finish with “El Resbaladero” (The Slide), a strong class 3 rapid that includes waves and small whirlpools. We will then have lunch in a traditional restaurant located on the riverside and owned by the local community family. This is a great chance to enjoy the Andean cuisine while supporting community projects. After lunch, we will rest for a short while before starting our two hours hike to Ollantaytambo, passing along Andean Terraces, still being used by local villagers for farming. We will reach a Mirador, from where we will have a spectacular view of Pacaritampu pyramid and the magnificent Ollantaytambo Inca fortress, among breath taking views of the Urubamba mountain range and the Urubamba river, views, which only few people have seen. We then descend to the Inca Bridge near Ollantaytambo from where our private vehicle will be waiting for us to transfer us back to our hotel in the Sacred Valley. Overnight in the Valley. We pick you up from your hotel and drive through the Andes, we leave from Piuray lake near to Chinchero community to start hiking in the morning from Cuper alto community and capture the sunlight on Mount Veronica and the Vilcabamba range. The walk is first uphill, then downhill over the altiplano overlooking the snowcapped mountains, slowly descending to the Inca site of Huchuyqosqo. This place was a palace on Inca times and is well preserved with high Inca structures made of stone and adobe (mud-brick). The beauty of these ruins is that they are built on the mountain top. With clear blue skies above and many streams running on either side. After relaxing in the shade of the Queñua trees (Andean Oak) while feasting on the prepared lunch, it’s time to continue on the hike. We continue our trek across the open terrain and begin the zigzag trail down the face of the mountain, until we meet our vehicle at Lamay, which will take us back to your hotel in the early evening. Overnight in the Valley. Transfer from the hotel to Km. 82, where we will meet our porters and equipment. We start our trek escorted by the porters, going through semi-arid terrain along the Uruamba River with magnificent views of snow-capped mountains. We leave the Urubamba valley and will have overview haveset off up the Kusichaca River to our first camp site in Huayllabamba (around 3000 m.a.s.l – 9842 f.a.s.l). Km 82 to Huayllabamba: 11 km / 6 hours approximately. After a healthy breakfast we begin to walk to the Warmihuañusca pass (4200 mts - 13860 ft. approximately). After a short time, we will reach the top of the pass. From this place, it is possible to see the other side of the way leading to Runkurakay ruins. At the end of a gorge, we will stop at a place called Pacaymayo (3600 mts. – 11181 ft.), our second camp. We depart from Pacaymayo and a while later a zigzagging but short ascent will take us to the Runkurakay circular ruins. There is no sign of human life, only great forests and abrupt hills. After a good rest, we will start our way down and then we can clearly notice that the Inca Trail is well preserved from this point. In a short while we will get the steps which go up to Sayacmarca ruins (3620 mts – 11946 ft approximately). From Sayacmarca the stone road begins to go into the jungle, continuing our trek towards Phuyupatamarca ruins. The trail crosses the "Lago Seco" and for brief moments we will go up and down. We will then cross "The Tunnel", a natural cavity produced by a landslide but adapted by the Incas. The Inca Trail well-traced borders continuous on the hills full of moss and ferns. After crossing a small pass, we will see some steep steps and under these the Ceremonial Center of Phuyupatamarca ruins (3650 mts – 12045 ft approximately). We continue hiking for 3 more hours until we reach Wiñaywayna (2700 mts – 8,856ft approximately), the main archaeological site after Machu Picchu in the Inca Trail, we will visit the site to then descend to our campsite. Pacaymayo – Wiñaywayna: 9 km / 7 hours approximately. Note: If passengers must return to Cusco the 4th day, then campsite must be Wiñaywayna. If passengers can get to Cusco the following day, then last campsite may be Phuyupatamarca. We start early in the morning going down the trail, from where we can see the Urubamba valley and the river. The path goes down to Wiñay Wayna ruins (2650 mts – 8745 ft approximately), the most important ruins after Machu Picchu, heading then towards Inti Punku (2740 mts - 9042 ft approximately), the Gate of the Sun, our last pass. A boxed lunch will be provided. From this place, Machu Picchu (2450 mts - 8085 ft approximately) looks unreal and beautiful. We have the rest of the day to visit the entire citadel. Then we will head down to the town of Aguas Calientes. Overnight. Visit the Citadel of Machu Picchu for the second time. For the most adventurous people, we suggest to go up the Huayna Picchu (if it is not raining) from where you can appreciate the immensity of Machu Picchu, even more amazing being high and distant. Arriving at the top takes about two hours and a half and it must be before 13:00 hours. It is necessary to register in an office at the beginning of the trail. In the afternoon, back to Cusco by train, and transfer to your hotel. 07 nights’ accommodation in a double room. 03 nights camping in a double tent. Tickets from entrance to Machu Picchu and archaeological sites mentioned in the itinerary. Permanent assistance by our offices in each city. Meals or any other item not mentioned in the itinerary. Tips to guides and hotel staff. Local Peruvian Taxes (18% tax is applicable only to Peruvian and foreigners living in Peru, to pay no need to show passport. All common camping gear: 2-man 3 season tents, sleeping mattress, kitchen dishes, kitchen tent, dining tent. Porters for the whole camping equipment. Porters will place campsite before passenger’s arrival to campground.